Hearthstone: Is Shudderwock already the most broken card in The Witchwood? – AiPT! Hearthstone: Is Shudderwock already the most broken card in The Witchwood? We’re only a day into the new Hearthstone expansion, The Witchwood, and already people are calling for Shudderwock’s ugly head. 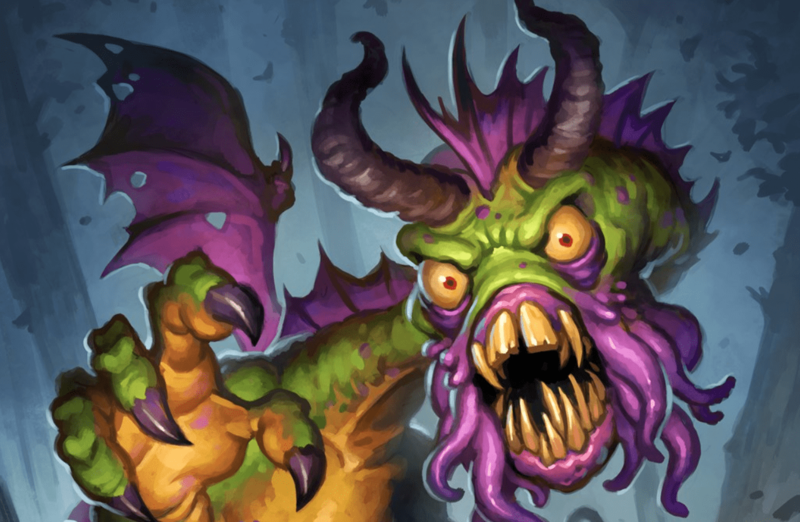 We’re roughly a day into the inaugural season of latest Hearthstone expansion, The Witchwood and already a single minion has whiffled its aberrant, purple-pustule covered, devil-horned head above the others in the “Card Most Hated” category. Shudderwock. Based on the Jabberwock, the eponymous creature from Lewis Carroll’s 1871 poem “Jabberwocky” (right down to artist Matt Dixon’s homage to the famous John Tenniel illustration), the 6 attack/6 health, 9-mana-cost minion has the ability to repeat *all* other Battlecries from cards a player has played in a game. For instance, if a player has played Fire Elemental, whose Battlecry deals 3 damage, playing Shudderwock repeats that 3 damage. Two Fire Elementals prior to Shudderwock placement would be 3 damage twice — and so on for any other Battlecry minion. If its devastating, “roided out Yogg-Saron” ability wasn’t crazy enough, Shudderwock adds insult to injury with a summoning quote that makes Grim Patron’s “Everyone, get in here” seem downright quaint by comparison. One that’ll go on. And on. And on, ad infinitum. Comment from discussion So what are you guys doing while your enemy Plays Shudderwock?. But is Shudderwock OTK Shaman a deck imbalanced beyond belief or are Hearthstone players merely suffering from the first day overreaction phase? It’s still too early to tell. Much of Shudderwock OTK’s prestige comes from the fact that it was one of, if not the most theorycrafted deck leading up to The Witchwood release and professional streamers, some of whom are among the world’s best players, are aggrandizing the deck’s strengths and playing it very well in a fledgling, unrefined meta. Once the honeymoon phase is over, the meta has been more thoroughly defined and the target Shudderwock’s immediate infamy has placed on its own head has spurred its fair share of counter decks, we’ll reassess. My take: Yes, the casting animation should be modified because people that are too proud to hit the “Concede” button might actually end up dying of old age, starvation or some agonizing version of both. Should Shudderwock itself be nerfed though? The extent of the nerf should be to make it 10 mana (so it can’t so easily synergize with Murmuring Elemental), and/or limit the amount of Battlecries it can repeat — but no more than that — Shudderwock should still retain most of its identity because although the deck is strong, it can be beaten, as its (as of this writing) win percentage sits at 42.4% over 373,891 games according to HSRreplay. Not exactly the sort of game-breaking statistic that Shudderwock haters would have you believe. Then again, being on the receiving end of a Shudderwock Battlecry chain is one of the most demoralizing feelings in the world, so the potential cost of therapy/psychiatric help might outweigh anything else. Until further notice, have fun in The Witchwood. Just beware of jaws that bite. And claws that catch.